Chop the leaves and base of pineapple. Let it stand on the base. Now peel the skin. Chop the sides into thick slices. By cutting this way you will be slicing the thorny outer parts only. Chop these thorny slices into fine pieces and blend them in a grinder to extract the juice. Slice the core of the fruit into round pieces. Finely chop few of these slices for mixing later. Now add boiled pineapple juice. Mix well and add boiling water. Again mix well and let it stay till it is cooked well. Lastly add finely chopped pineapple pieces, saffron strands and mix well. Layer the top with the remaining ghee. Cover with a lid and switch off the stove. 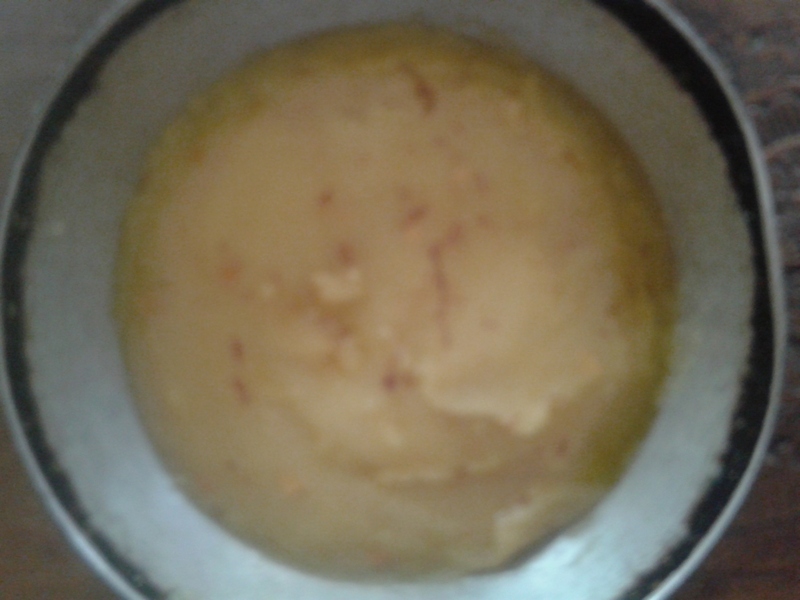 Steaming, piping hot delicious Pineapple Kesari Bath is now ready to be served. Garnish the round pineapple slices with salt and pepper or chilly powder. Serve this along with Kesari Bath.